It’s been a pretty exciting few months for the Local Digital Declaration. You may remember the launch back in summer 2018, co-authored by 45 public sector organisations including us at the Ministry of Housing, Communities and Local Government. We started encouraging eligible organisations to sign up to its principles pretty soon after. And now, six months on, we’re getting close to the 150-signatory mark - including nearly a third of all principal English local authorities. 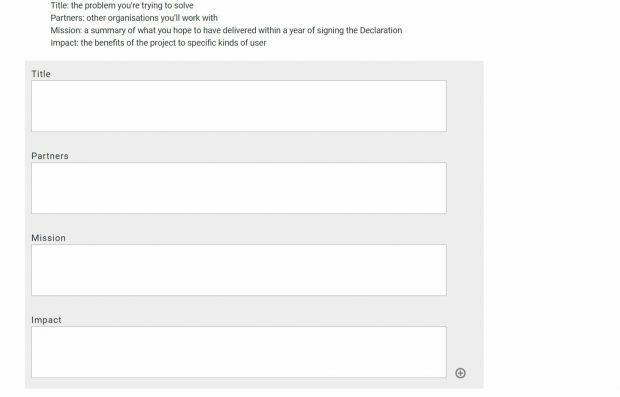 When an organisation signs the Declaration, they have to submit a commitment to a Declaration-friendly digital project that they’re going to carry out within the next 12 months. We promised at the Declaration launch that we’d publish these commitments, so that organisations could lead by example, see what each other were up to and scope out opportunities for learning and collaboration. Following up on that promise has been at the back of our minds for months, but what with administering the Local Digital Fund, running roadshows and everything else we’ve had on our plates, it’s had to go on the back burner for a bit. 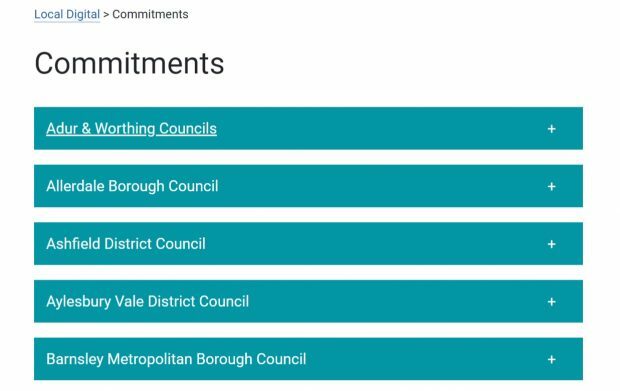 But now that our team has grown, we’ve had some breathing space to get this sorted… And we’re pleased to say that all those commitments are now live on our website! All local authority signatories are listed on our website. They’re not in the prettiest or most useful format at the moment - we’ve gone for the quick and dirty approach to get them out there while we’ve got the chance. We welcome input from any data wizards out there who want to do something funky and useful with them. There is, understandably, some overlap between the projects detailed in commitments and those included in expressions of interest and full applications for the Local Digital Fund, which we’ve published elsewhere on our website. However, there are also some really great examples of projects that weren’t included in funding bids. Tonbridge and Malling Borough Council wrote about a project they’re undertaking with Gravesham Borough Council, to conduct research into how less digitally aware council employees understand service redesign and digital solutions that are introduced. They hope that investigating this will be the first step towards ensuring all staff have the right support to use digital tools and feel fully involved in the council’s digital agenda. Or East Suffolk Council, who are working with neighbouring councils to create a digital application process for their ‘Warm Homes, Healthy People’ scheme, which helps vulnerable people and families make their homes cheaper to heat. The project aims to enable surveyors to capture all the information they need about a property in one visit using an intelligent online and mobile-friendly form that integrates with a database, and make an application for the scheme at the same time. They believe the new approach will be more efficient and GDPR-compliant, and boost joined-up working across councils in the area. Doncaster Council's committed project as seen on the Commitments page of the Local Digital website. 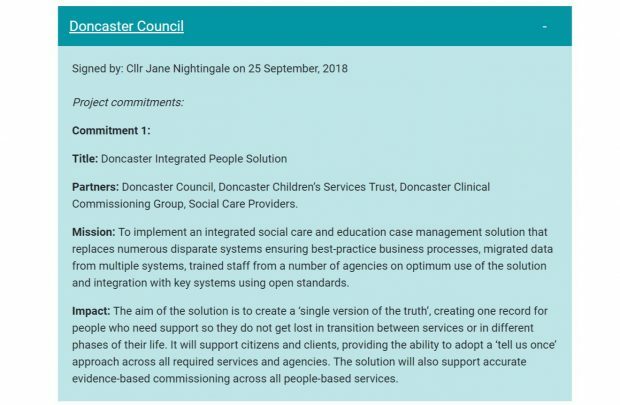 We also liked the sound of Doncaster Council’s plans (pictured above) to bring together multiple separate education and social care case management systems into a single record for those who need support. They plan to use an open standards approach to ease integration between the systems, and hope that it will help ensure individuals don’t get ‘lost in transition’ as they move between services. It’s not just councils that are signing the Declaration, of course - any non-profit public sector organisation can make a commitment, and that’s just what the West Midlands Fire Service have done. They’ve signed up with a project that’s aiming to solve common public sector issues around data collection and sharing that are caused by proprietary ‘system-centric’ approaches - such as vendor lock-in, complex integrations, prohibitive licenses, and so on - and they’re calling for partners across the sector to help them. Is your organisation planning something similar? Are you aspiring to adopt an open standard solution that you can share and iterate with others in the sector? Are you hoping to find some partners to team up with who share the same ways of working? If so, getting your organisation signed up to the Declaration is a great first step. Each of the committed projects must clearly define the mission, the desired impact and the partner organisations involved. Give our guidance on making a commitment a thorough read. This sets out what we mean when we talk about commitments, and it’ll help you get yours right first time round. Make sure your senior responsible officer (SRO) is on board. When you submit your commitment, you need to specify an SRO to approve it before we can publish it. This person needs to be someone with the authority to commit the entire organisation, not just your team, to working in line with the Declaration principles. It’s usually the Chief Executive or Leader of the council. Before you sign, then, make sure you’ve identified such a person, explained the Declaration to them and got them on board with its message. Then once you’ve submitted the commitment, tell them to look out for a confirmation email in their inbox - there’s a link in it they’ll need to follow in order to sign it off. Identify a specific, Declaration-friendly project to commit to that you’re aiming to complete within 12 months - not an organisation-wide goal. For example, ‘conducting user research to find out why there are so many missed bin collections’ or ‘piloting a digital tool that will bring together information about adult social care services in the area’ would be great examples. But ‘driving forward our digital transformation agenda’ or ‘making the council a one-stop shop for all local services’ wouldn’t make the cut because they’re too broad and long-term. Remember, you can write about a single stage of a project as your commitment if you’re delivering a wider project that’ll span more than 12 months. As long as the bit of the project you’re writing about is in line with Declaration principles and is specific enough, it’ll work fine as your commitment. Make it clear in your commitment how your project is, or is striving to be, in line with Declaration principles. So, if you can, tell us how your project is user-focused, how it’s driving digital leadership, how’s it’s encouraging the use of open standards, data sharing and ‘working in the open’, and how it’s enabling collaboration and reuse of research and solutions. If you want to keep up to date with our work in this space you can sign up to our newsletter, visit our website or follow @LDgovUK on Twitter to learn more about what we do.